We have been eagerly following the SatNOGS project for a while. 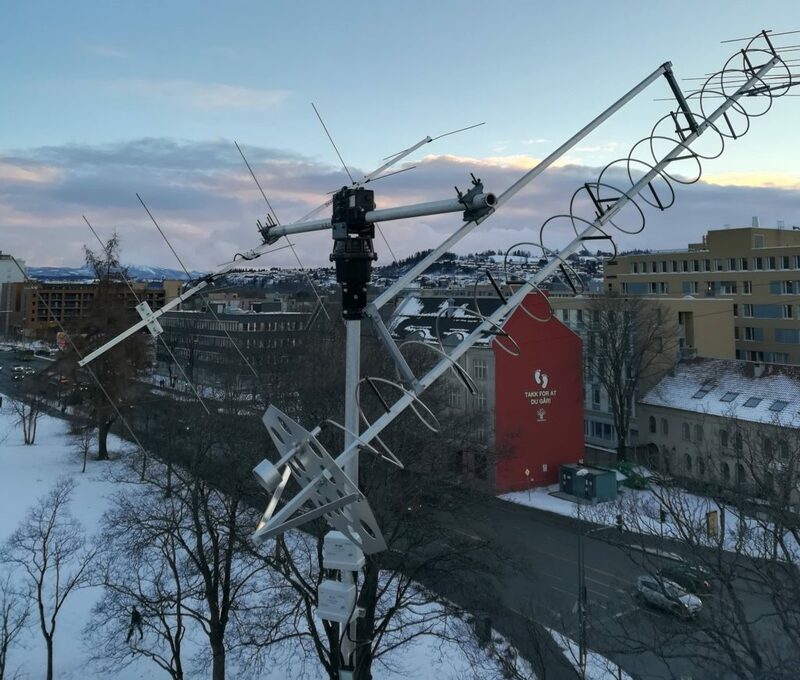 The author was part of deploying it at the local university CubeSat ground station, LA1NGS, and since then we have also wanted to deploy a similar station at Samfundet. 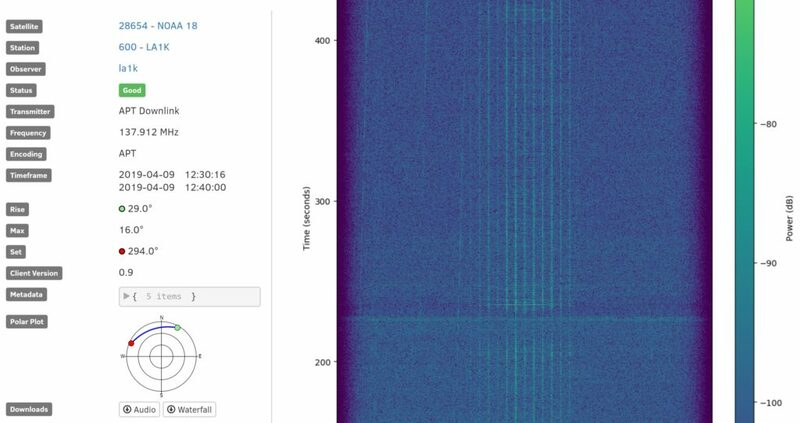 SatNOGS is an open source networked satellite ground station service. The service allows users from all over the world to access data from satellites, in a global way that until now has only been possible by utilizing expensive proprietary services. This is particularly useful for CubeSat teams, radio amateurs and others that find interest in the data, but do not necessarily have the funds to access the corporate networks. A screenshot from LA1Ks observation of the NOAA 18 satellite. Last year, we wrote a piece about replacing the rotor at LA1NGS ground station. In the aforementioned blog-post, we also commented on how we acquired the leftover G-5500 rotor – and how me might use it to deploy our own SatNOGS station. Well, we did just that. LA1K SatNOGS station, with 2 m antenna (left) and 70 cm antenna (right). After a short building period, the LA1K station is available with 2 m and 70 cm coverage on the SatNOGS network. So far we have made over 20 observations, and are really excited to see how well it performs. We will come back to details on the station setup in later blog posts. 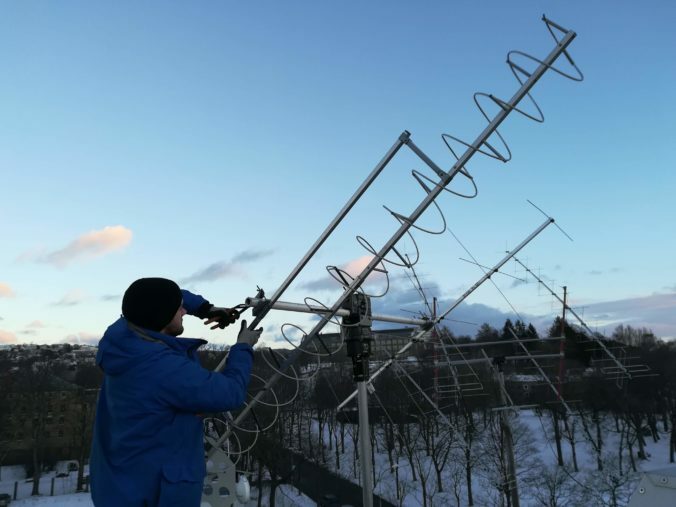 Thanks to DK7ZB for the 2 m yagi recipe, SatNOGS for an incredibly cool satellite ground station network, and the LA1K members that helped build the station.